Electrochemical machining (ECM,PECM) is a modern high-tech high-precision method of machining conducting materials and alloys, which is based on fast dissolution of the processed item material with simultaneous exposure to pulse current with electrolyte running through the interelectrode spacing between the processed item material (anode) and tool electrode (cathode). 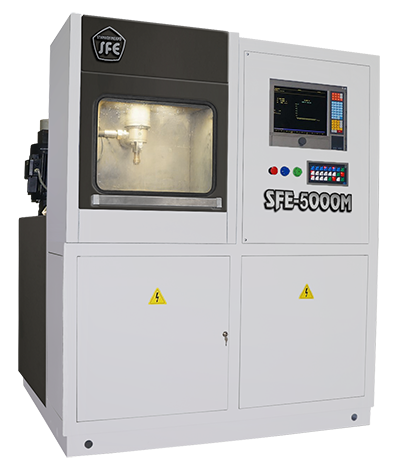 During the process of dimensional electrochemical machining direct or reverse copying of tool electrode shape and dimensions at the whole surface of the processed workpiece is performed. Finished parts, dies, matrices of the most complicated shapes with good characteristics of accuracy and roughness can be obtained as a result of only one tool electrode linear motion in Z coordinate, for a short period of time, using SFE electrochemical machine operating in the pulse-cyclic mode. 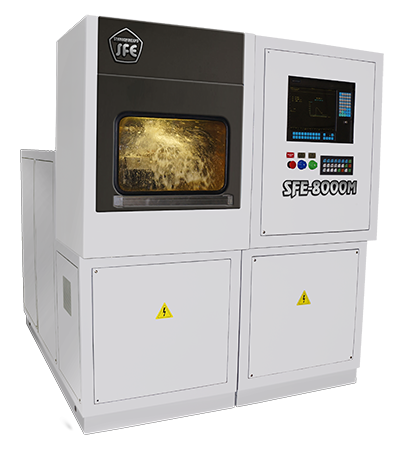 By implementing only one electrochemical machining operation into the technical process of manufacturing articles it is possible to reduce the performance time of manufacturing a finished product by several times, eliminating a great number of mechanical and manual finishing operations, release workers and power intensive equipment. A processing detail is anode (+) and during processing moves with working feed (S). A tool electrode is cathode (-) and during the processing it fluctuates at frequency (F) and amplitude (A). Direct pulse current power supply-pulses are synchronized with fluctuation of tool electrode. Electrolyte is a water solution of salts (NaCl, NaNO3 and other). A processing surface control system (CC) controls the working feed (S) and provides minimum requirement electrode gap. In the process of electrochemical machining (ECM) or dimensional electrochemical machining (DECM), also called electrochemical shaping, working characteristics of tool electrode (negative cathode) copy with the speed of anode dissolution to the workpiece (positive anode), which obtains the mirror image of the same shape and dimensions, that the copied tool electrode has. 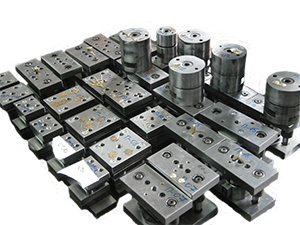 Machining process goes with the minimum allowable interelectrode spacing in contactless space. In addition to it according to M. Faraday law, the mass of the material removed from the workpiece is proportional to the product of current running (processing) time and current intensity. During processing constant high-speed pumping of conducting electrolyte fluid is maintained in the interelectrode spacing to ensure timely removal of dissolution (electrolysis) products and to prevent from boiling. Tool electrode (cathode) is mirrored in anode workpiece (processed article) with high accuracy and quality of the processed surface. An electrode itself is not worn out because a water electrolyte layer of 0.01mm is always maintained between the electrode and a workpiece. Through this layer power directive transmission goes with pulse current exposure (up to 6000A). The process of an accelerated directional destruction of the processed workpiece material structure is performed on ionic level. The roughness of the processed surface is practically identical to the surface of electrode. During the operation process electrode oscillates along Z axis in the vertical plane with the frequency of 50 Hz. Electrode vibration allows to pump electrolyte and supply electric current impulse at the required vibration stage, for example to provide high precision of copying current impulse is supplied at the moment when the distance between the processed surface and the electrode is 10 micron. Tool electrode is made from any conducting material usually copper, brass, bronze as the most easily processed with the traditional mechanical method and corrosion resistant to corrosive medium with the methods of traditional design as well as applying computer engineering. The absolute absence of wear of tool electrode used for processing is ensured (unlike with other processing methods). 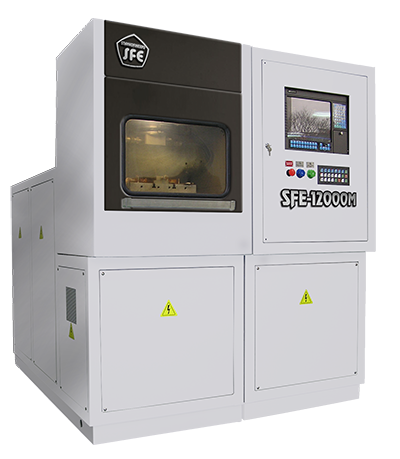 It is an obvious advantage of the technology of electrochemical direct copying with SFE machines. Later the tool electrode for the manufacturing of which the work cycle time was spent will be used only once for production of any lot of working tools or finished articles without any limitation by number. With the finished tool electrode it is also possible to restore a worn working die to the necessary size for the minimum time. An electrode, specially designed and made with a traditional method such as mechanical processing, including CNC milling and engraving machines; engraver’s, metalworker’s manufacturing, with photochemistry method, stereo lithographic processing and further metal coating with galvanoplastics method, using article samples from metal, using article samples from nonmetal materials with a conducting coating made with galvanoplastics. A finished article made from a conducting material (as usual copper, brass, bronze, steel). A finished article made from any conducting material bought or brought by Customer. When manufacturing electrode from other materials (steel and others) it is necessary to observe the developed preservation rules for their storing. Tool electrode is not worn in the process of electrochemical machining, so that observation of the storing rules ensures the identity of shaping surfaces in the workpieces. To prevent natural corrosion of electrodes, workpieces and articles processed with electrochemical machining it is necessary to wash them with warm water and dry after removing from the machine. For long-term storing we recommend to use anticorrosive lubricant. It is possible to use wood, plastics and other non-conducting materials as a tool electrode. With this purpose it is necessary to make them a conducting coating of metal (copper) for example with galvanoplastics method. All types of tool steel, stainless, alloy, structural, corrosion-resistant, high-carbon, chromium, chromium-nickel, high-speed including heat-treated steel are well processed with SFE electrochemical processing machines. Also magnets and their alloys, nanostructured steels and alloys, copper, bronze, brass, nickel, silver, gold, platinum and their alloys are processed without any problems. It is possible to process titanium, titanium alloys, hard alloys, metal ceramics, aluminum and its alloys with electrochemical machines. For these materials it is necessary to use specially selected electrolytes. Standard 12% water solution of industrial sodium nitrate NaNO3 used in SFE machines does not suit for electrochemical shaping in this case. You can receive more detailed information about electrolytes for electrochemical machining of various hard alloys and titanium in specific literature.